KAILUA, Hawaii, Aug. 29, 2011 (SEND2PRESS NEWSWIRE) — Each woman’s story is different but the images and words portray a similar spirit of courage and strength. In her book, “Portraits of Aloha Hope,” photographer Sohee Chu captures the motivation behind 23 women who live in transitional clean and sober houses provided by Women in Need (WIN). There they are bridging the gap from incarceration, homelessness and addiction to a new life. Through real-life vignettes, Chu captures the spirit of new hope. Whether they find strength through the joy of reading, a desire to spend more time with their children, or a love for God, these women share stories that will inspire many in their own journey. “It was a privilege to connect with these women. I thank them for allowing me a small glimpse into their daily lives,” says Chu. She met with each woman to see what motivated them to move forward, and told each hope-filled story through her camera. The result is a powerful collection of portraits which say more than words could ever do. The book release event will be held at Trinity Church, 875 Auloa Road, Kailua, Hawaii, on Saturday, September 10, 2011 at 9:30 a.m. Many of the women photographed will be present with the support of family and friends; the author will speak and present each woman with her own copy of the book. 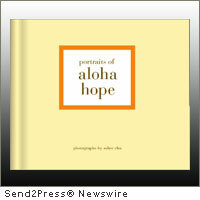 “Portraits of Aloha Hope” will be available for $45 with all proceeds going to support WIN. Seating is limited; an RSVP is required. More information: http://portraitsofalohahope.com . Sohee Chu is a photographer, designer and principal of the strategic design firm iSohi, inc. (www.isohi.com). She has won a Travel & Leisure award for her photography and multiple awards for creative solutions for companies from startups to leaders in the Fortune 500. Women in Need is a nonprofit that empowers families to recover from domestic violence, homelessness, substance abuse, and incarceration. WIN transitional housing, where these portraits were taken, is just one of the group’s outreaches. The organization serves over 300 women, men and teens each year; many of their past clients come back to help as a volunteer or staff member. To learn more, visit http://win-hawaii.org .